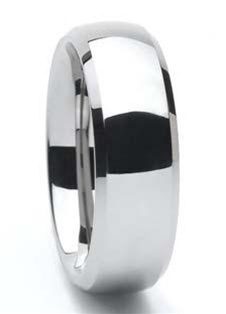 A timeless and classic design, this tungsten carbide ring comes in a width of 8mm. The Classic Bevel has a high polish finish and comfort fit. This is a bevel version of our classic dome wedding ring. This classic comfort-fit domed wedding band now comes in tungsten carbide. Similar to our other rings, our Tungsten Forever bands are permanently polished and the craftsmanship is simply unparalleled!